Spoiler alert: I found God. He lives in the sketchiest part of North Philly. I’ve been mentally in Scotland for the past three months. I’m almost done with the book, but if you know anything about Scotland, you know that it can drive anyone insane. 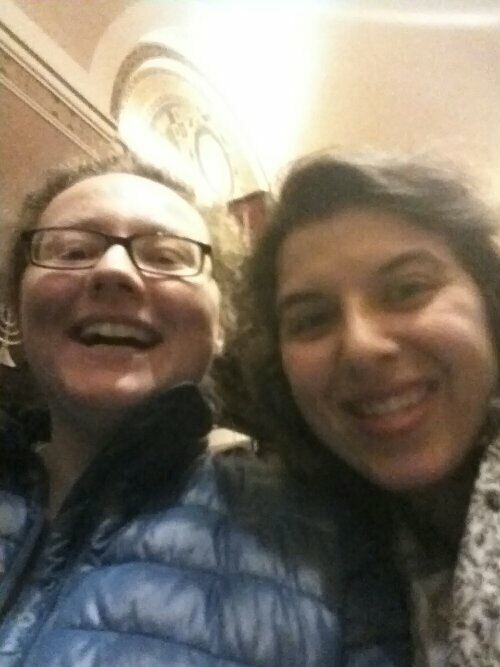 So I decided to take a break and come back to, you know, my own ethnicity by going to an Idan Raichel concert with my friend Allie. Idan Raichel is an Israeli musician who collaborates with other performers in almost every language possible to produce beautiful songs and has been touring since 2002. The last time we saw him live was in Washington, D.C. at Sixth and I when I was still living alone and Allie was still in grad school. This time, he came to Rodeph Shalom, and I finally had a chance to check it out. It is breathtakingly beautiful inside. 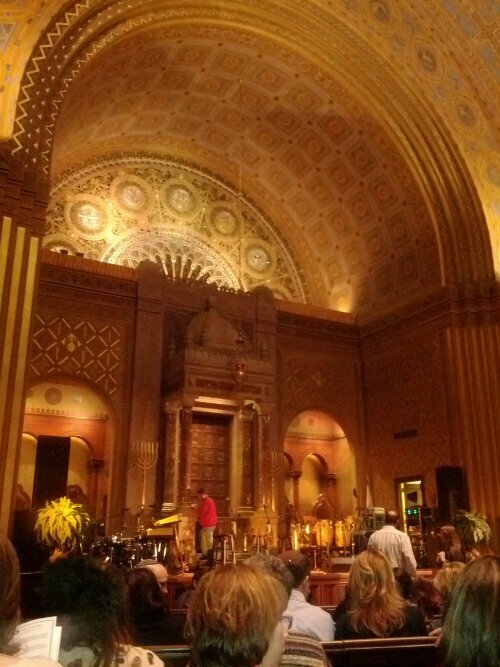 One of the only synagogues that has impressed me more is the Spanish Synagogue in Prague, where Mr. B proposed. Unfortunately, Rodeph Shalom is located in a part of North Philly that quickly starts to go south right around the synagogue-what you would call in Hebrew the SCHUNA- so I was torn between admiring the beautiful architecture and fearing death. Allie and I had been under a lot of stress over the past couple weeks and we had to physically force ourselves to come, to stay late after work, even though we both knew we would love it. We weren’t alone. The entire audience was 100% full of Israelis speaking Hebrew and obnoxiously trying to reserve seats in the front, and Allie and I became extremely homesick for Israel and started speaking Hebrew ourselves. 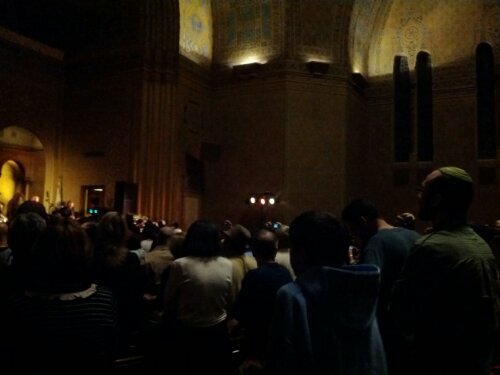 We didn’t stop for the duration of the concert. 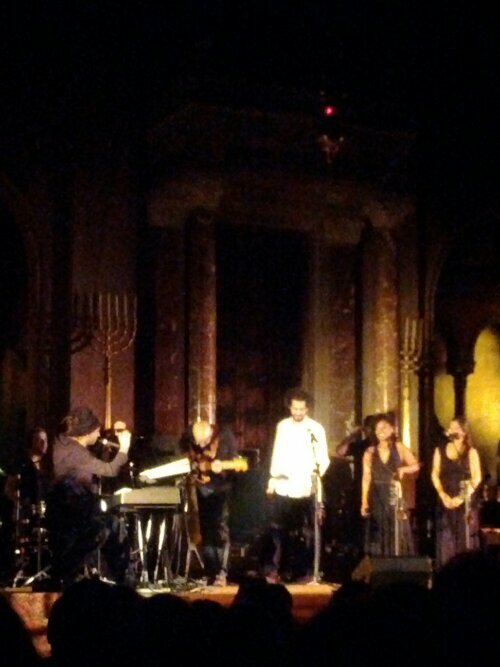 When everyone settled down, the band came out and so did Idan with his trademark dreads (at the keyboard). The combination of the stress of the past couple of weeks, the excitement of sharing the experience with Allie who understood what it was to miss Israel, and the highly spiritual feeling of the synagogue, surrounded by Israelis, produced a profound sensation in me that is the closest I’ve ever felt to feeling there is something warm and heavy enveloping all of us and watching all of us. I felt remarkably non-stressed, like all my cares were in the hands of something else, or like a soft blanket was covering me. 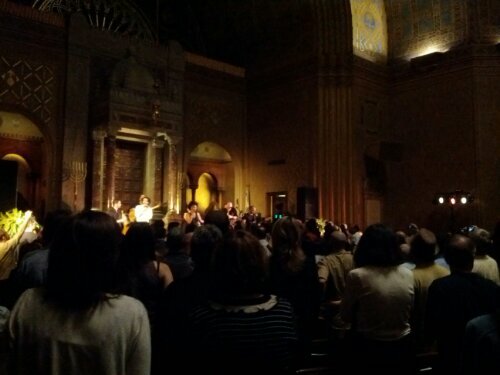 The something warm and heavy was at the top of the dome of the synagogue, emanating out from the musicians’ guitar strings and trumpets and spreading comfortingly through the darkness. When they launched into Mimamakim, I was struck, like a piano key. I was taken back much further than the last time I’d heard it with Allie. 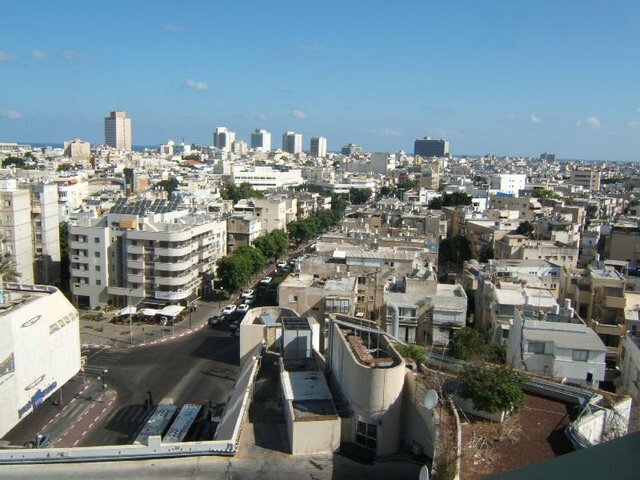 I stood on the balcony of the apartment I shared with my roommates during my internship in Tel Aviv, all of my suitcases packed, the finality ringing in my ears. I was waiting for the cab to take me to the airport, but I didn’t want to leave just yet. The apartment was empty: my roommates had either already left or were out buying stuff before they left. The sun was setting on the skyscrapers in the distance and I was trying to furiously imprint the scene in my mind. 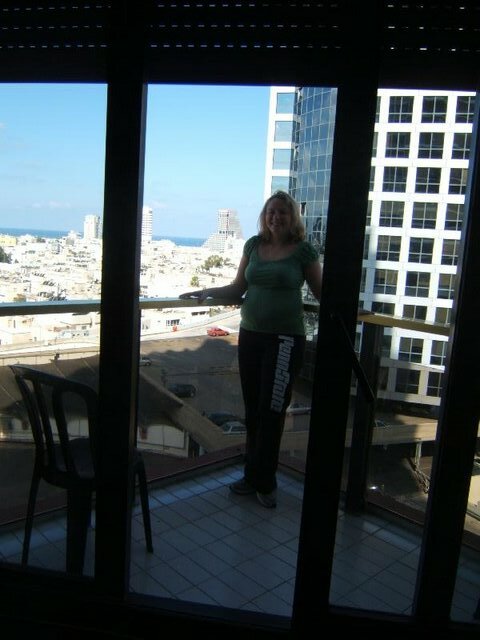 I didn’t know when I’d be back to Israel, and I missed it desperately already. I tried to hold on to it like a drowning man looking for a raft. Tel Aviv was serene in the late summer dusk. The computer was playing this song in the background. Someone had given it to me on a CD. I sang along with the song, and I sang along with all the other songs. By the middle of the concert, during the faster songs, people were standing up and dancing. A small mosh pit had formed near the stage, and soon, the whole audience was standing and dancing. Allie and I danced and sang the entire concert. We let out all the pent-up energy that comes from working 9 to 5- no longer being 18 and allowed to be stupid in Tel Aviv, or no longer being 21 allowed to be stupid in Washington, D.C. We let out all of our fears and regrets through our hands and our hips, and we laughed, surrounded by our people-people who understood the lyrics, people who understood that I missed Dizengoff no matter how dirty it gets in the summer, and people who understood that , even if you live in the far reaches of the diaspora and you have to listen to your Israeli musicians in a synagogue where you might get shanked after you leave, it doesn’t matter in the moment-you stop thinking about it, close your eyes, and dance.